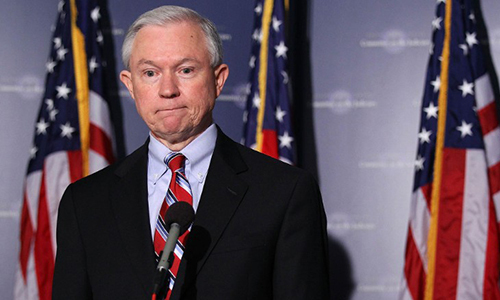 The United States’ National Governors Association has collectively sent a letter to newly installed US Attorney General Jeff Sessions over any possible attempt by Sessions to support federal-level legislation that might seek to formally ban most forms of online gambling within the US. Sessions has been an outspoken critic of the 2011 legal opinion authored by former US Attorney General Eric Holder which stated that the 1961 Wire Act applied only to sports betting, an activity banned in 46 of the 50 US states. Holder’s opinion addressed a grey area in the US’s online gambling laws, opening up the way for several states to authorize online-lottery ticket sales, online casino games and poker, and much more. Holder’s opinion also opened up the door for daily fantasy sports (DFS) to be offered across much of the country. Sessions has not gone so far as to announce his support for the RAWA (Restoration of America’s Wire Act) bills paid for by Venetian casino owner Sheldon Adelson, but his viewpoints seem to align with such a nationwide prohibition, despite such a view being a minority opinion within the US. Besides that, a RAWA-style bill would be a glaring infringement on traditional US “states’ rights,” in which each state has for centuries determined the type and extent of gambling allowed within its bureaus. The regulation of gaming has historically been addressed by the states. While individual governors have different views about offering gaming—in a variety of forms—within their own states, we agree that decisions at the federal level that affect state regulatory authority should not be made unilaterally without state input. A strong, cooperative relationship between the states and federal government is vital to best serve the interests of all citizens. As you review this issue, we encourage you to take note of the current regulatory mechanisms put in place by the states to ensure that consumers and children are protected, and that licensees comply with strict standards of conduct. States are best equipped to regulate and enforce online gaming. A ban drives this activity offshore to unregulated jurisdictions, out of the reach of state and federal law enforcement and with risk to consumers. The nation’s governors stand ready to discuss this issue with you further. The letter was signed by the NGA’s chair and vice-chair, Governor Terry McAuliffe (D-VA) and Governor Brian Sandoval (R-NV), and officially sent to Sessions on Monday. Sessions has issued no public reply to the NGA volley, and indeed, it may be well down on his list of concerns. America’s new AG, a former Senator himself, continues to battle evidence that he lied repeatedly on multiple topics during his confirmation hearing in order to win approval. For the moment, however, he is the US’s Attorney General, meaning his opinions and actions on many matters carry ongoing weight.